Earlier this month I picked up the december issue of Glamour magazine. After reading about (and lusting after) the stunning Katy Perry I wasted no time in grabbing the free Nails Inc. nail polish that came with the mag. They were designed by Kate Spade, a famous designer who makes really lovely, quirky clothes which remind me of a much more stylish Ugly Betty! There were four different colours in the range but I went for the gorgeous 'uptown glamour'. It's a lot more refined and toned down than I would have expected from Kate Spade but the shade really jumped out at me as it is so lovely. It reminds me of molten gold - a hybrid of standard nail varnish and glitter. It's basically like glitter polish's older, more glamorous sister! Moving the bottle, the shade changes between a dark, almost brown gold to a super shiny silver. It has tiny flecks of both gold and silver glitter which translate lovely onto the nails. The finish of the polish itself is also really different - it's like a mixture of matte and standard polish and doesn't have a shine, but isn't fully matte. This is two coats of polish on my nails - but without a bottom or top coat. I didn't use a bottom coat as I had issues the first few times with the polish moving and not setting properly on the bottom coat. I also haven't used a top coat as I think it would ruin the matte-shiny finish the polish has. I know that this is going to cut the lasting time of the polish but the effect is so lovely I don't want to change it! I really do love everything about this polish - I think it is so wearable and easy to build up if you prefered to make a bigger statement with it. I can see me wearing this constantly over the christmas period as it really does have a festive feel. I also think it would work really well layered over other colours to give a sheer-glitter top coat. It's also a bargain at £2 for both the magazine and polish! Have you tried any of the other colours? Mean Girls is by far one of my favourite and most-watched films. I'm pretty sure I know literally every word and me and my best friend are well known to have conversations of just MG quotes (is that sad?!). Last week I bought two lovely cushions as presents for my sister and best friend for Christmas. They both have hilarious little MG quotes on them and that got me thinking of what other gifts there are based on MG and if any of them were actually any good. I'm pretty pleased with the ones I've pulled together here and think they'd be lovely little gift ideas for any friends or family members who love the film. Firstly we have one of the most amazing mugs I've ever seen. I'm considering buying one for my best friend and making her present MG-themed as a hilarious joke. I've actually done that with her before as her last name is Hines so I once bought her lots of things to do with Heinz beans, such as a money pot, a mug, and a baked bean recipe book. I'm still pretty impressed with myself on that one! Anywho - back to the mug. This is such a cute little present and I think it's pretty good money for just over £10. We then have the typical 'you can't sit with us' tee. I've seen these floating about the fashion bloggers world, mainly on the likes of Rosie Glow. I think these slogan tees are so fashionable and humourous and I really think I might end up buying one of these - or possibly one of the hat versions instead! I then found this really lovely phone case for the iphone 4 (I think). I really love this and am trying to hold back from buying it myself! I love the black and white pattern on the back and how it isn't an obvious in-your-face MG slogan. Plus it has one of the best quotes from the film on it too! Finally we have this canvas full of all of the MG quotes. I do think that this is a bit of a cheap/tacky looking canvas and I can't really see me putting this up on my wall or buying it for someone else, but I really love how it contains all of my favourite quotes! Also, I just thought I'd share a picture of the cushions I picked up myself. I got these from a lovely vintage store in Preston and haven't been able to find them online anywhere so sorry about that! 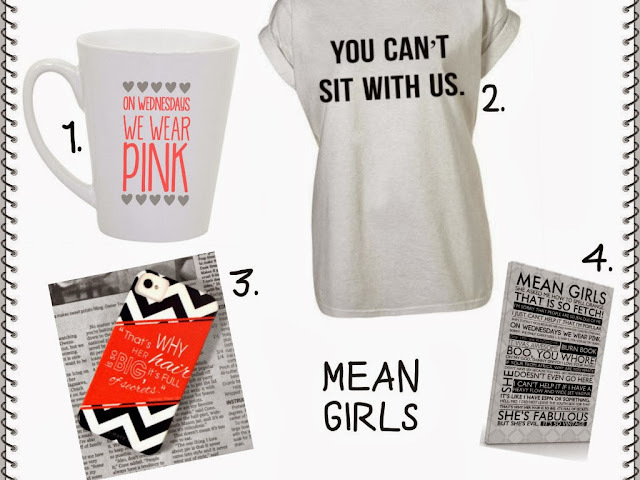 Are you a fan of 'Mean Girls'? Would you buy any of these? ever since i first fell in love with the soap&glory eyeliner i've been wondering what to try next from the range. about a month or so i decided to pick up this lip balm on a whim, as i had the 3 for 2 deal that was recently on in boots. the lip balm actually comes in 4 different flavours/shades (vanilla bean, sweet coconut, juicy peach and chocolate cherry) but i picked up the translucent coconut shade. the first thing that caught my attention was the scent - i love anything coconut so was instantly drawn to it. the smell of coconut is really lovely and natural - it doesn't smell manufactured or is too overpowering but is just the right amount. it doesn't taste like coconut though - which i guess is a good thing as i won't be licking my lips constantly when i have it on! onto the texture; i really can't say i liked the texture of this lip balm. it cam out quite sticky on me and so i really didn't feel like i could wear it out every day due to the wind we've got at the moment. i can imagine my hair getting stuck all through this. i also didn't notice much in terms of moisture on my lips. it seemed to just coat them rather than add moisture and get rid of my dry patches. this lip balm was £5, which i think is a tad on the expensive side for a lip balm, as you can buy really good lipsticks for the same price, but it was free so you can't complain! i definitely won't be buying this again but i do feel like it was a really lovely product to try and i will definitely keep on using it due to the smell alone. i think i will be keeping to my vaseline in future - moisturising and un-sticky! have you tried this lip balm? would you? i can't believe that i bought this playsuit a month or so ago and never got round to photographing it! i didn't know whether to buy it or not as i fell in love with it but thought it was really expensive at £48. but i asked on instagram and facebook and it was a unanimous yes so i couldn't leave it behind! plus with student discount, it wasn't AS painful handing the money over. i wore this earlier in the week when i was going to uni. i mainly wear it during the day and dressed down but i have worn it on a couple of nights out as well. it's such an easy-to-wear playsuit that you can dress up or down and it has so much detailing that it really takes minimum styling. i think the cutwork on the top and sleeves is so pretty and is really flattering too - it really pulls me in. the short part is also really lovely - they don't crease easily and usually stay pretty perfect. i have a playsuit from topshop last year which creases really easily so i always make sure they don't now! i also love that it has pockets - any piece of clothing that has pockets instantly becomes a winner with me - is anyone else the same?! i just threw on my most recent purchase from new look in terms of this lion necklace. i love how chavvy it is and in your face, it's crazy how a few years ago everyone thought gold chains etc. were really tacky and now they are staple for everyone! today i'll be talking about my new baby, the RT powder brush. i have wanted this brush for a good 6 months or so and finally bought it a few weeks ago. i already have the core collection and was blown away by the quality of these brushes, and you hear so many good reviews on RT that you know you can't really go wrong. i use the brush to apply my face powder all over the face and down the neck, but i have seen people use it for blusher and bronzer as well so it's really well-rounded for uses. i wanted this brush as it is so dense and soft that it makes applying my make up both quick and comfortable. it is so huge that i only need to do a few swipes and i'm ready to go. i also sometimes like to stipple my powder onto my skin (mainly over blemishes so the concealer doesn't budge) and the brush does really well at this. i find with some brushes that they can start to irritate the skin after a while as the bristles stick into the skin, but this brush is still soft even with stippling. i'm yet to give this brush a really deep wash but if it is anything like the core collection it will wash like a dream and i won't lose softness or any of the bristles. i really do recommend RT for brushes as they are so worth the money and i use at least one or two of mine every day. they are really good quality and i can't see myself using any other brands for a long time now. i'm definitely looking at expanding my collection even more now - stippling brush, i have my eye on you! first of all i need to apologise for my naughty absence for the past week or so - i pre-scheduled the past few posts as i knew i'd be crazy-busy with uni work that i wouldn't have time to write in the middle of it all. i haven't been answering any comments and being a good little blogger but i'm back on track now as i have a 3-week break before my next assignment has to be handed in. PHEW! now let me introduce you to my new baby - i've been after a boyfriend coats for months now and finally settled on this little one from new look. i've had a right search on for the perfect coat and have tried so many on - i first tried this new look coat on in-store and absolutely loved it but didn't end up buying it and have been kicking myself ever since as it's pretty much sold out now (it's only in size 14 online!). i then decided to order this lovely little number instead and when it arrived i did really like it and thought it was really pretty and snug but the fur collar really annoyed me and didn't settle with my hair - i looked like a bit of a drag queen really! so in the end, i decided to go for this one. it wasn't in stock for weeks and weeks so i had to request an email for when it finally came back and it did last week. i do really love it and think it looks lovely with a dress or skirt or pants - pretty much everything! it's quite bulky on the body but the arms are pretty tight so it still stays feminine - but it can be hard to wear layer under it because of the tight arms. i would say to be careful to not get it caught on things aswell - the thread is easy to snag on literally everything (i get stuck to my bracelets ALL the time!). but other than that i love everything about this bad boy. 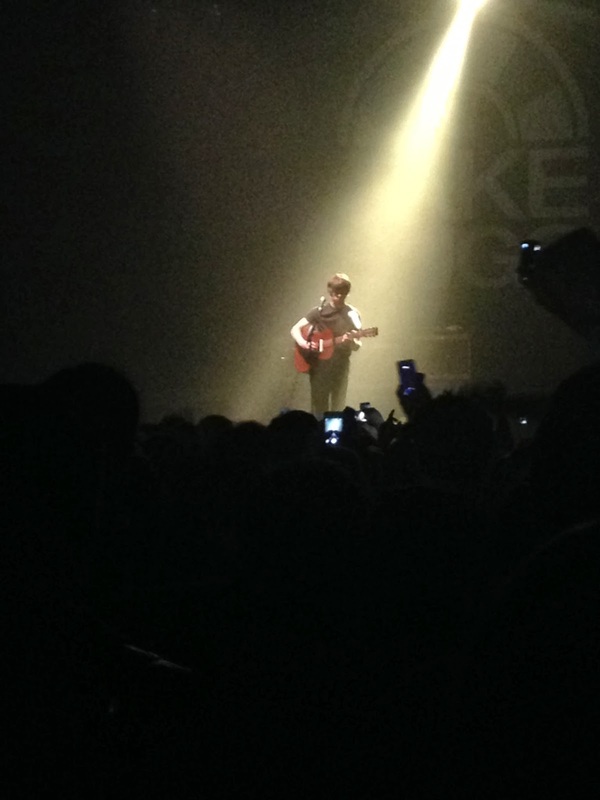 in other news, i went to see jake bugg last night and it was seriously one of my favourite concerts - it was at the o2 apollo in manchester which is one of my favourite venues as everyone is stood up and it always reminds me of concerts back in the day. i got some pretty good videos and pictures - i put some up on instagram (laurapratt_) - and the entire night had such a good vibe. jake bugg is such a talented guy - i was shocked at his skills on the guitar at the same time as singing and he seemed really down-to-earth and humble about everything he did. there was no messing around and no unnecessary chat so it was just my cup of tea! i hate when artists tell their life story between every song or are late on stage. he really was a gentleman to his fans! i'm usually very samey with my eye make up, i just sweep on some liquid liner and mascara and go. however, sometimes i really love mixing it up and adding some colour, and i have quite a few looks i go to regularly - and i'm going to share one of these looks with you today. 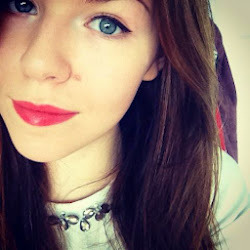 these are the products i used to create the look - liquid liner, mascara, an eyeshadow primer and the urban decay 'alice in wonderland' palette. i was lucky enough to buy this palette off ebay in 2010 a couple of says after it was released. you can still get it now, but the prices are pretty high. the palette itself includes 16 shades, two 24/7 eyeliners and some primer potion. none of the shades are new releases - they are all existing UD eyeshadows but the names have been changed to fit in with the alice in wonderland theme. the shades i used were oraculum (baked), queen (last call) and underland (flash). 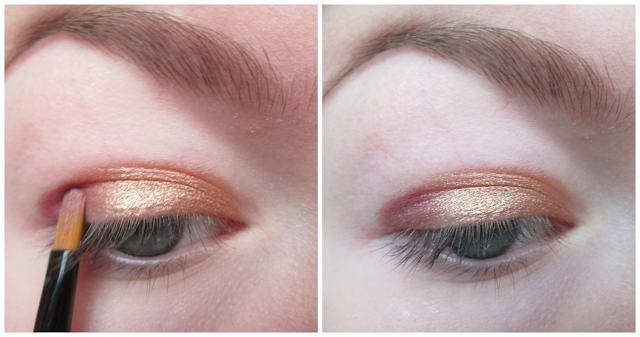 oraculum is a really lovely copper-gold, it's quite dark and really well pigmented. 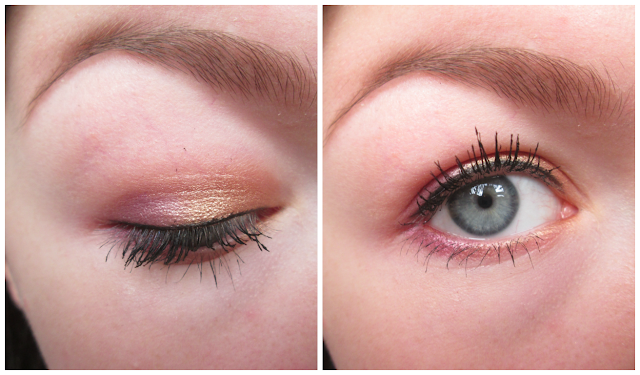 queen is a cranberry shade with a really warm hint of gold to it. underland is a bright purple which is crazy-pigmented. with all of the shades, you only need a little to go a long way as they are so pigmented. they are also really smooth and easy to apply. i first applied a primer to my lid (MUA's pro-base primer) and then applied oraculum to the inner two thirds of my eye, stopping at the crease. i used a flat shader brush (MAC 242) and packed the shade on. i then took queen and applied it to the outer third, blending it into the gold. i used the benefit talent brush as it is so thin and helps to control where the product goes. i then blended the edges to give a seamless look using the MAC 224 brush, a really big fluffy brush. this can sometimes make the colours lose intensity so you can go back in with the shadows to add it back. i then took underland on an even smaller brush (an UD liner brush) and added a small amount right into the middle of the purple shade. this just added a little more dimension and colour to the purple part to really make it pop. i then brought queen and oraculum under the eye to the bottom lid and blended them together in the middle, just to pull the look together. i then lined my upper lid with my trusty soap and glory supercat liner and falsies mascara to finish off the look. i've been turning to this look whenever i've been on a night out recently and get lots of compliments on it. 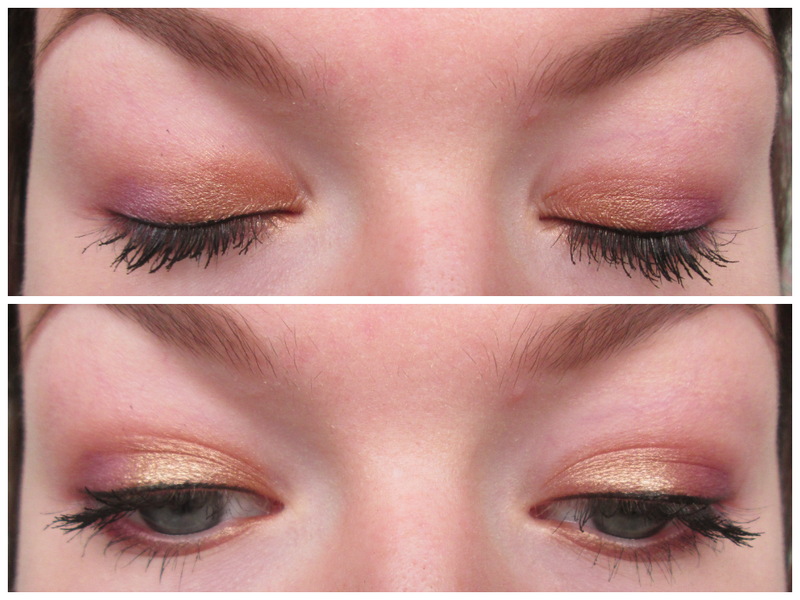 i really think gold and purple work well together, and these UD shades really do stand out and last. to do you think this is a pretty look? would you wear it yourself? i think a crumble is the perfect winter pudding. 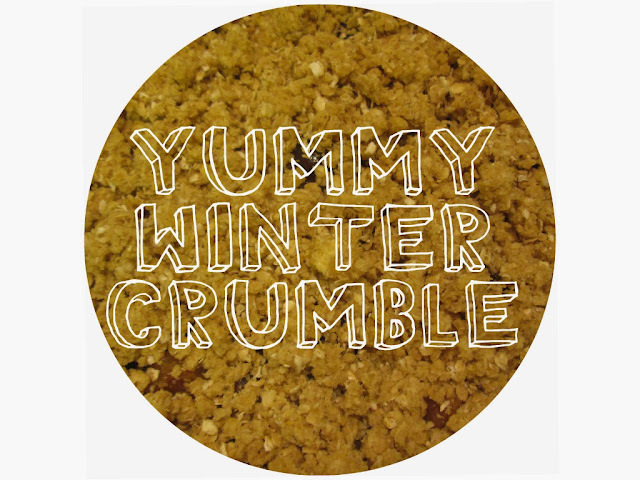 i can't think of anything better than sitting in your toasty front room with a huge bowl of hot, sweet crumble. this is my recipe for a lovely plum and cherry crumble, i hope you enjoy! 1. set your oven to 190 degrees celsius. start cutting up all of your fruit into bite size pieces. remember to destone any of the fruit that has them in - not a pretty find when you're eating it! 2. put the fruit into a bowl and cover with the sugar. sprinkle in as much cinnamon as you like (i like a lot of it!) and then mix all of the ingredients together until the fruit is covered by the sugar. 3. in a separate bowl, sieve in the flour and then add the sugar. mix them together before adding in the oats. finally, dice the butter into smaller chunks and then add this to the oat mixture. 4. now this is the messy bit! put your hands in the mixture and rub the butter into the oats. this is my favourite bit just because you can really smell the butter! it's ready once it's formed into small clumps of crumble mixture. 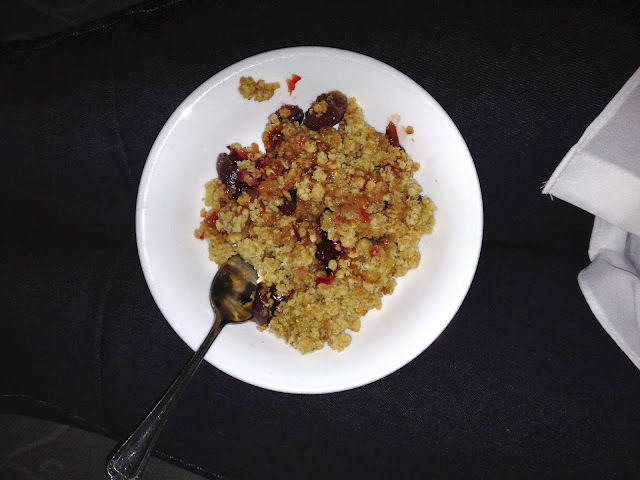 5. put the fruit into an oven dish and then evenly spread the crumble mixture on top. 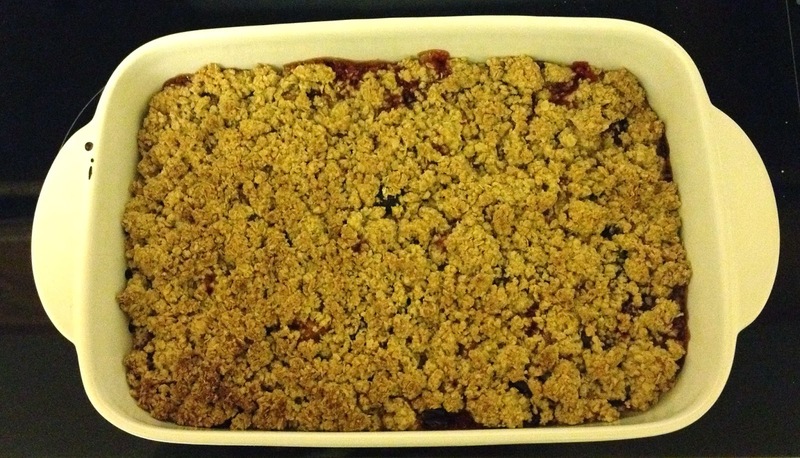 6. bake for a good 30 minutes or until the crumble is golden. 7. leave to cool for 5 minutes or so for it to cool down a little and then enjoy a bowl of damn good loveliness. what's also great is that you can change up the fruits in the crumble too and add whatever you fancy - peaches, blackberries, raspberries, apples! will you be making this? what's your favourite winter pudding?